I'm a huge fan of those who dare to be different. As a full-time traveler turned cat cafe reviewer, I know it's not always easy to choose the path less trodden and that's why my heart holds big love for Curious Cats. The cafe used to be called Lady T's and realizing they were not like other cat cafes, the team decided to embrace their differences by focusing on being the only non-profit cat cafe in the UK (with an aim to become a registered charity). Unlike other cat cafes that have rescues, Curious Cats takes in those that are truly forgotten. Old, sick or injured? Missing an eye? Fur has seen better days? All are welcome in this inclusive cafe and I'm tearing up just thinking about it. The day we visited, we had several sweet kitties decamp to our table for a warm lap and personal attention. We gave them plenty of extra cuddles and found it very difficult to leave even though the time on our parking meter was up. There go the tears again. It's not that Curious Cats is sad, but rather I have a tender heart when it comes to unwanted/ abused/abandoned felines. If you have ever had a cat in your lap that has had a tough life, but then looks up at you with peaceful contentment, how can you not mist up a bit? Why don't I discuss the other aspects of Curious Cats while I grab a tissue? The facility is set up over multiple floors as a proper old-fashioned tea room although I loved how there were some cheeky design elements such as masks and quirky photos. Seeing as it was Halloween, however, that might have just been holiday decor. 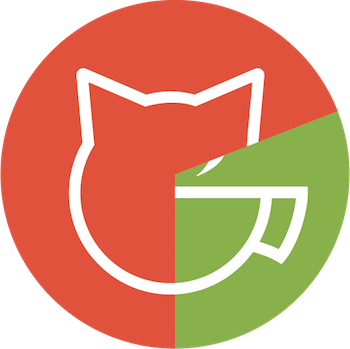 This cheekiness extends to their logo (one of the coolest cat cafe logos ever! ), a tattoo-esque image of Alan Wrinkleman, Sphinx extraordinaire and resident mascot. That's Curious Cats. Civilised and edgy in equal measure. I must mention that the staff are absolute angels- polite, kind and helpful. Also, the quality of our order of a latte and coffee was excellent. Yes, it's a touch on the catty side, so if you have allergies, I'm sure there's a Costa down the street to help you. But if you care deeply about cats and want to help the least fortunate of them, pay a visit to Curious Cats and consider an extra donation if you can.